The big boys of India’s e-commerce segment are going desi with a vengeance. Their brand taglines say it all. From IndiaMart’s Kaam yahin banta hai to Olx pe bech de, Hindi is the language of choice for short and quirky catchphrases aimed at grabbing instant attention. The ‘Aur Dikhao’ campaign of Amazon.in, an online platform that offers customers wide choice and a destination where they can find, discover and buy anything that they desire to pick up online, has been one of the company’s key strategic pillars. “Our new integrated marketing campaign ‘Aur Dikhao’ is inspired from consumer insights that point to the fact that the Indian customer loves to be spoilt for choice while making purchase decisions,” says an Amazon India spokesperson. Sumit Bedi, vice president–marketing, IndiaMART, points out that with internet penetration growing beyond 20 per cent, a huge new wave of online buyers are in mix. “We target SMEs, who prefer to communicate in a vernacular medium rather than in English,” he adds. “We have experienced that very few people are comfortable communicating in English. Hindi is the leader in terms of the language segment. I believe if you are targetting such regional users, a desi tagline helps the brand get closer to them as they can easily relate to it. For an Indian brand like us targeting Indian users primarily, communicating in a language that is best understood by the majority in a particular region is the ideal approach,” said Bedi. IndiaMART has translated the tagline into Tamil, Telugu, Kannada, Malayalam and Marathi as well. 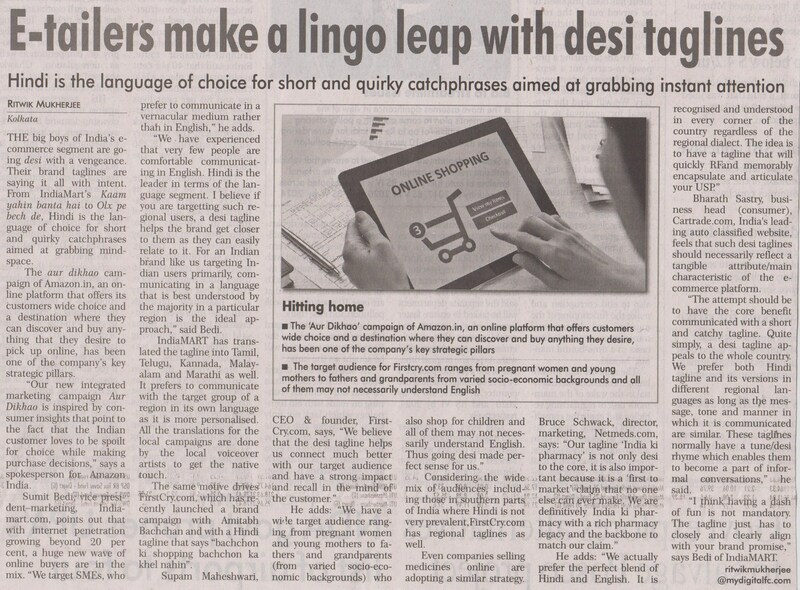 It prefers to communicate with the target group of a region in its own language as it is more personalised. All the translations for the local campaigns are done by the local voiceover artists to get the native touch. The same motive drives FirstCry.com, which has recently launched a brand campaign with Amitabh Bachchan and with a Hindi tagline that says “bachchon ki shopping bachchon ka khel nahin”. Considering the wide mix of audiences, including those in southern parts of India where Hindi is not very prevalent, FirstCry.com has regional taglines as well. Bharath Sastry, business head (consumer), Cartrade.com, India’s leading auto classified website, feels that such desi taglines should necessarily reflect a tangible attribute/main characteristic of the e-commerce platform. “The attempt should be to have the core benefit communicated with a short and catchy tagline. Quite simply, a desi tagline appeals to the whole country. We prefer both Hindi tagline and its versions in different regional languages as long as the message, tone and manner in which it is communicated are similar. These taglines normally have a tune/desi rhyme which enables them to become a part of informal conversations,” he said. “I think having a dash of fun is not mandatory. The tagline just has to closely and clearly align with your brand promise,” says Bedi of IndiaMART.